Chinese consumers are rapidly catching up to American shoppers and, in some cases, they are already overtaking them. This is a world-changing trend that is moving away from the decades that have seen consumers in the United States as the driving engine of world economies. The recently released Bank of China (BOC) report reveals that Chinese consumption together with aggressive investments are expected to produce an 8% growth in the second largest economy of the world in 2013. Investment stands as the predominant growth influence currently, but consumerism is projected to outperform investment within the next decade. Also, within this period of time, the consumer market in China is expected to become the world’s largest, surpassing the consumer habits of the American market. The government think tank State Information Center added to the projections, stating that they expect a 14.5% growth in consumption just within the 2013 year. They suggest that growing consumerism will provide the fuel necessary for key restructuring of the economy which will, in turn, ignite greater consumer activity. Chinese consumers have already surpassed Americans in the purchasing of luxury goods. A report released by Bloomberg News shows that, currently, Chinese shoppers make up a full 25% of the market for expensive items purchased with the United States trailing at 20%. This uptick in luxury sales is due to a rapidly growing middle class within their society. With a large number of workers netting more income, they are increasingly becoming affluent and savvy shoppers within bustling cities, buying both China products and those imported from outside the country. Also, high end stores have been setting up in large numbers over the past months and credit card use is soaring among well-to-do Chinese consumers. A major factor that is slowing down China’s run for world consumer dominance is a weak European economy that is directly affecting China sourcing and doing business in China. The grueling and stubborn economic downturn across Europe (and the United States for that matter) has kept the Euro low and, therefore, more attractive to shoppers. Chinese consumers with growing incomes and buying power often strike out to Europe on special shopping trips to grab deals on luxury items which means they don’t buy from China businesses. Although workers in China are enjoying more expendable incomes, they are still very price conscious and looking for deals in order to get the most products at the best price. This trend of going outside of the country to purchase desired items will no doubt continue as long as the Euro remains weak, slowing China manufacturing of similar products. These travel spending sprees are sure to increase as long as Chinese worker wages rise, giving Chinese shoppers more available funds to spend on expensive brands that are offered at better deals in the European markets. If major brand name manufacturers and venders want to capture Chinese business, they will be required to come up with inventive ways to increase sales within their market and not only abroad. It is sobering to note that major world economic changes are occurring which could significantly redefine who controls the fueling of world markets. If current trends continue, it looks like China and not the United States will soon be the dominating consumer force on the world scene. Small and micro-sized enterprises (SMEs) are receiving a boost from the government of China. The move is an acknowledgement by the country that such firms producing China products are a key element of creating jobs and provoking scientific innovation. Although China manufacturing and other sectors are still experiencing strides in growth, more challenges are arising both within the country and abroad due to the continuing debt crisis in Europe. This is much welcomed news to those who operate and support SMEs as well as those who buy from China because such businesses are continually faced with pressures against operations, significant difficulties in obtaining financing and rising costs. Eighty percent of China’s jobs are a direct result of enterprises that are small to medium-sized and, therefore, are seen as something worthwhile for the government to invest in. Acquiring bank credit for continued growth and expansion is a major challenge to SMEs. Most banks tend to ignore smaller businesses, preferring instead to dole out monies to large companies. Enterprises which are state-owned are at the top of the list for bank attention which places a huge hurdle in the path of struggling SMEs. Fifteen billion Yuan, which is equivalent to around $2.38 billion, has been earmarked by the Chinese central government for use in boosting SMEs in hopes of relieving some of their financial stress and making it easier for those doing business in China. The majority of the development fund is to target new start-up businesses that fit within the confines of SME guidelines. The Chinese government is also setting up a system whereby they can evaluate commercial banks that are active in providing small firms with credit and other financial aid. Qualified banks will receive the means by which they can issue bonds in order to gain more funds to funnel into SME firms. Other banks will be encouraged by the State Council to increase or provide credit support to SMEs. Targeted specific recipients of such additional financial aid will focus on programs supplying affordable housing, agricultural sectors, and major construction projects which are ongoing. Further assistance announced by the government is to allow greater foreign and private capital and international funding use by relaxing current restrictions. Small and micro-sized firms will also be permitted to list on China’s stock market. Furthermore, the development of new technologies as well as equipment and techniques will be encouraged and 3,000 incubation bases will be established in order to encourage the start-up of new SMEs. The creation of public service platforms is also on the agenda to support the new surge of SMEs, improving services to and from them. Financially, there are several items which were addressed and made policy back in 2011 that China says will be honored. Small companies which pay business and corporate value-added taxes will see the threshold raised, low profit businesses will enjoy income taxes reduced to half (until 2015), and a 3-year pardon of bank stamp taxes for those small firms which hold lending contracts. The business atmosphere for small and micro-sized enterprises appears to be looking up which is sure to strengthen the base for China sourcing. The Chinese versus the US is a challenging book that argues that the Chinese, because of its belief in Mercantalism, has already begun a trade war not only against the US, but against the entire World Trading System. And not only that but the fact that China is winning! It is a thought provoking article that demands action. Dr Matt Buttsworth is an expert on the Chinese and world politics. He is also the author of “Polarshift – India, China and the Rise and Fall of the West” and of the popular world history analysis work “Genghis Khan and the Creation of the Modern World”. The Chinese market is huge and creates large opportunities for entrepreneurs and businesses to expand their market. This purchase will help Nestle regain traction in the Chinese baby-food market, where it has been losing market share. Nestle SA (NESN), the worldâs largest food company, won regulatory approval in China for its $11.9 billion acquisition of Pfizer Inc. (PFE)âs infant-nutrition unit. Did you know that Foreign investors who put at least $1 million into a US business and meet other requirements can be eligible to apply for a green card. The minimum investment in high-unemployment areas such as East Toledo is $500.000. Ancient China collides with newfangled America in this epic tale of opium smugglers, sea pirates, and dueling clipper ships.Brilliantly illuminating one of the least-understood areas of American history, best-selling author Eric Jay Dolin now traces our fraught relationship with China back to its roots: the unforgiving nineteenth-century seas that separated a brash, rising naval power from a battered ancient empire. It is a prescient fable for our time, one that surprisingly continues to shed light on our modern relationship with China. Indeed, the furious trade in furs, opium, and bêche-de-mer–a rare sea cucumber delicacy–might have catalyzed America’s emerging economy, but it also sparked an ecological and human rights catastrophe of such epic proportions that the reverberations can still be felt today. Peopled with fascinating characters–from the “Financier of the Revolution” Robert Morris to the Chinese emperor Qianlong, who considered foreigners inferior beings–this page-turning saga of pirates and politicians, coolies and concubines becomes a must-read for any fan of Nathaniel Philbrick’s Mayflower or Mark Kurlansky’s Cod. Two maps, and 16 pages of color and 83 black-and-white illustrations. China Economy – Will leaders keep it growing? The Chinese governments credibility comes from making life better for its people. Clearly it is in the best interests to maintain growth in manufacturing and exports. This is not only vital to maintain credibility at home but to also maintain stability. As we watch the decisions of the nations leadership in the months and years to come, this should prove very interesting. This article will be informative to our exporters and other businessmen who are challenged on the issue of doing business in China. 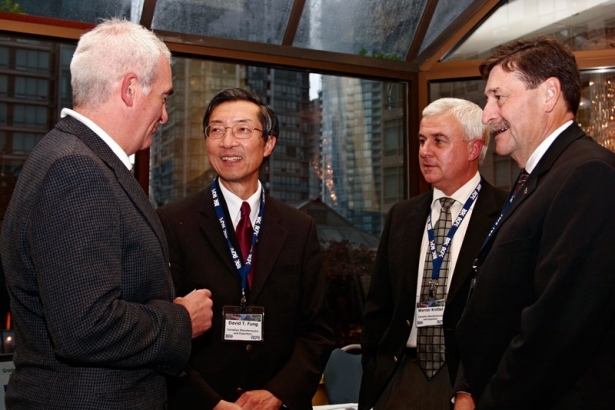 Doing business in China – Canadians get boost. This is the biggest foreign trade treaty since NAFTA. It will come into effect on Nov. 1 and remain in effect for the next three decades. It will be interesting to see what it will mean for small and medium Canadian businesses in China. Beth Hong The Canada-China Foreign Investment Promotion and Protection Act (FIPPA), Canada’s biggest foreign trade treaty since NAFTA, will get domestic approval status at the end of October.